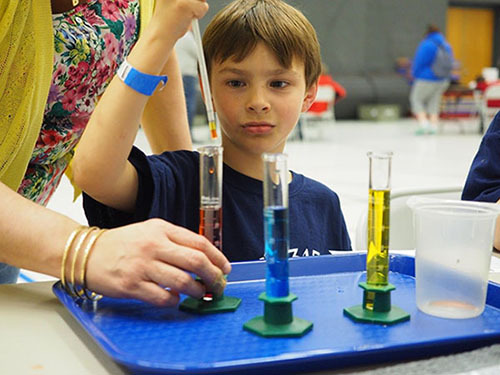 Sidewalk Science is a "carnival style" sequence of guided inquiry investigations in which students through middle school investigate physical science concepts in a fun and engaging informal environment. A novel aspect of Sidewalk Science is the use of volunteers from the client school or organization to actually mentor and teach young learners. Physics and Astronomy Outreach service learning students and volunteers set up the activities and then train parents and grandparents, high school students, teachers or community volunteers in the key points of the activities. While the explorations are modestly scripted, there is plenty of room for improvisation by the mentors. 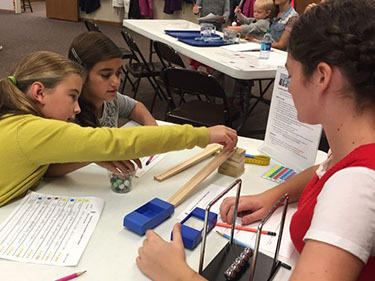 The trilogy created among young learners, client organization volunteers, and Physics and Astronomy Outreach, provides a synergistic approach to learning science in non-traditional settings. Students are assembled following the program for a discussion, to solidify some of the concepts presented, relate to everyday and real world applications, and to provide opportunities to engage our volunteers with questions. 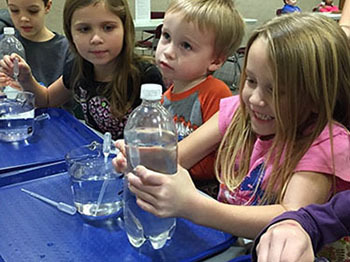 One of students' favorite stations is Squiddy the Cartesian Diver, focusing on the concepts of buoyancy, and sinking and floating. Students make and test their own diver, which can sink or float at will by varying the pressure they create in the container. Investigations in addition to Squiddy, further explore the related concepts of buoyancy, gravitational force and density. For example, Vanishing Weight delves into the phenomenon that a treasure chest is a lot easier to lift and handle under water than it is above. Why? It's the buoyant force of course! Density Straws (below) challenges the students to determine which among several colored salt solutions is the least and most dense by layering them one by one in a soda straw. Another series of Sidewalk Science experiments relates to electromagnetic phenomena. In Electric Circuits, students explore ways to complete a circuit using a battery, bulb and only one wire. Conductors and Insulators builds on Electric Circuits with students predicting whether assorted items will act as electrical conductors. In Magnetic Forces, shown below, investigators learn the relationship between current in a wire and the magnetic field it creates. 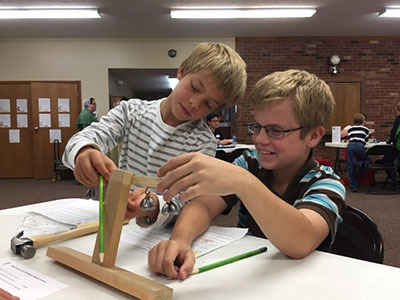 This same investigation also allows the student to characterize various items as being either ferromagnetic or non-ferromagnetic. The force of gravity and distance form the framework for experiments relating to the center of mass. In Prisoner of a Chair, students learn why holding a brick in front of you extends your center of mass, making is easier to stand up. Teeter Totter Weights takes a semi-quantitative look at balancing a beam with different masses placed at shorter and greater distances from the fulcrum. 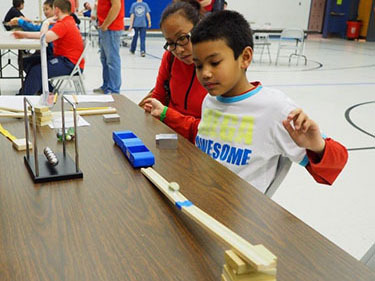 Inertia and Momentum is one of several investigations into Newton’s Laws during which students study the consequences of colliding objects and how the effects of mass and velocity play out in real life. The appeal and success of Sidewalk Science is the result of frequent contributions from both graduate and undergraduate students in the service learning courses offered through Physics and Astronomy at Purdue. In addition, Department faculty frequently contribute resources and expertise in the creation of activities related to their research. Professor Tongcang Li, for example, provided materials for Bending Light, an experiment relating to refraction. 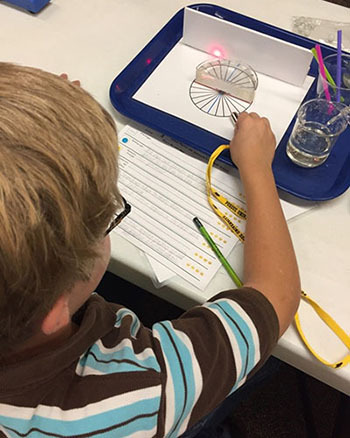 In this investigation, students use a laser to examine the refractive index of several liquids and how, when the index of refraction between two materials is the same, they can become nearly impossible to distinguish! 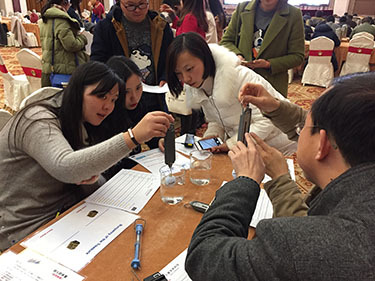 Physics and Astronomy Outreach took Sidewalk Science to Nanjing China to present this innovative program to elementary grade level educators at an international conference on elementary education in cooperation with Jinagsu Second Normal University. Dr. David Sederberg, Physics and Astronomy Outreach Coordinator, and Physics and Astronomy Professor Carina Rebello, engaged elementary science educators with the philosophy and presentation of Sidewalk Science. Physics and Astronomy graduate student research assistants graciously translated ten Sidewalk Science experiments into Chinese! 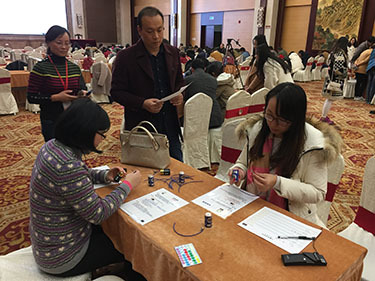 Approximately 200 teachers attended the session as part of The 2016 International Symposium on Elementary School Science Education in New Media Era, held in Nanjing. 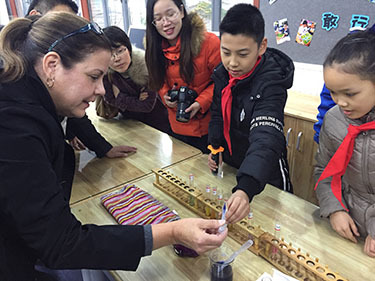 Outreach Coordinator Dave Sederberg and Professor Lynn Bryan also visited two elementary schools in Nanjing in preparation for our service learning study abroad course. Students in grades 3-6 presented some of projects on which they are working. 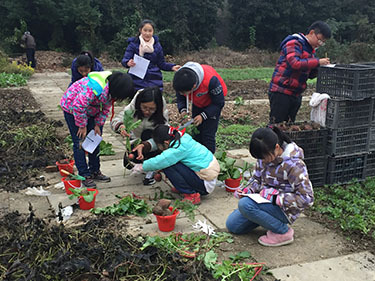 Purdue students participating in our STEM Service Learning Study Abroad course will travel to Nanjing in May, 2017 for three weeks to work one on one with elementary teachers and students in a selected local school. Sidewalk Science is based on the premise that young learners can explore and learn fundamental concepts of science in the context of the everyday. While Sidewalk Science has several dozen investigations in its repertoire, we typically present 10-15 stations at any given time, tailored to the needs and focus of the event or local curriculum.